backup – Learn Picasa and Google Photos! You don’t use the disk for anything else. Burn your backups and then put the disks away in a safe place. 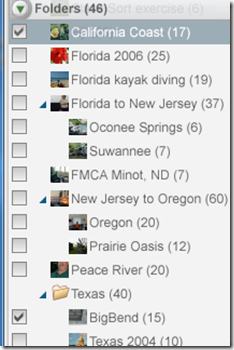 Open Picasa and click the Tools menu and Backup Pictures. You should now see some options open up at the bottom of your screen. There is a box #1 and a box #2. 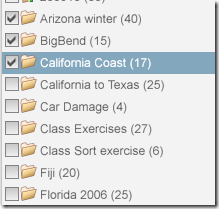 In #1 you should see an option to use an existing backup set, or create a new one. You need to create a new one here for the complete year of 2012. 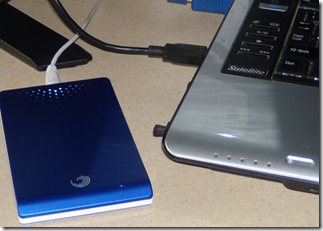 You have your choice to backup to CD/DVDs or to an external drive. Give it a meaningful name like 2012 Complete. The blue status line tells you exactly how many folders you have selected, how many files are in those folders, the size in Gigabytes of all the files you’ve selected, and finally, how many CDs or DVDs you will need. In my case, I need 6 DVDs. Make sure you have the DVDs handy, insert the first one, then click the Burn button. 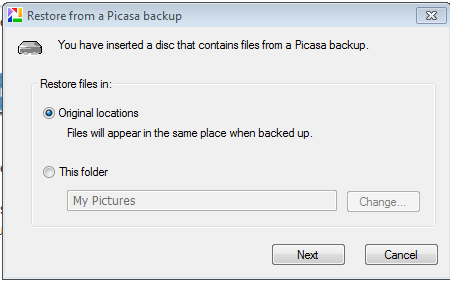 When Picasa fills up the first disk, it will ask you for the next one. It will keep asking until the entire backup set is finished. Whenever you make any kind of backup, you’re not done until you test it. There’s nothing worse than believing you have a good backup and not finding out that it didn’t work until you need it. It’s best to use a different computer for this, but if you only have the one, that’s fine too. Just take one of the disks and put it in the drive. It will initially pop up with a dialog box asking if you want to Restore – no, you don’t – so just click Cancel button. What you want to do is simply Explore your disk. You should see a folder named $pictures, open that and you should see your folders. Open a couple of folders to check that there are indeed pictures inside. If so, then you’re all set. Put the disks away in a safe place and give yourself a pat on the back! Geeks on Tour is a membership website. There are lots of tutorial videos on editing your pictures with Picasa’s tools. The first 3 are free for all to view. To see all of them, you need a Geeks On Tour membership. It’s only $7/mo or $58/yearly. Join Today! Question: I need to transfer my complete Picasa library from my desk top computer to my new laptop computer. Suggestions? Great question! I know a lot of people are getting new computers these days, and Picasa can make it very easy to transfer all your pictures if you do it right. 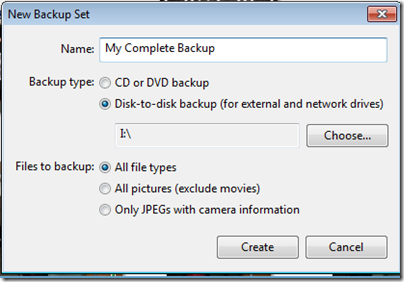 What you do is make a complete backup of your pictures on your desk top computer, then restore that backup to your new laptop. Use Picasa’s backup tool to do this. You will need a USB drive to do this. 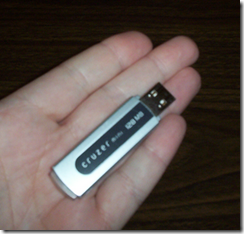 A thumb drive will do if it has enough capacity, otherwise you’ll need an external hard drive. Picasa will inform you how much capacity you need. Otherwise, you can use an external hard drive. Now, under #2: Choose folders and albums to backup, click the Select All button. This may take a few seconds. When it’s done, Picasa will report to you the size of the combined files. Make sure your USB device is large enough to hold all of it. In my case, I would need a device with at least 85.6 GB of free space. You may want to use disks (CDs or DVDs) for this, then you will have a permanent archival copy of all your pictures as well. I am recommending USB drives because of the potential space necessary. There’s no way that I’m going to sit there and feed it 20 DVDs! If you want to use disks, you would need to change the option in #1 above. When it’s ready, click the Backup button. If your Backup button is grayed out, it probably means you don’t have enough free space on the destination drive. It is important to use Picasa’s Backup tool rather than some other kind of backup because Picasa will also backup your Album definitions, Face recognitions, and other Picasa-specific data and settings. When the backup procedure is completed, you can take the USB drive to your new computer. After you plug it in, it should automatically run the restore program. If it doesn’t automatically do this, then you’ll need to navigate on your USB drive to the Picasa backup location, find the file named PicasaRestore.exe and double click on it. Make sure to Restore files in Original Locations. This is important if you want your Albums to be restored correctly. Remember, Albums are just pointers to the actual pictures. The pointers won’t work if the pictures aren’t in the same places. Click Next, then click Restore Files. In just a minute, your entire library will be recreated on your new computer. Then, at the end of the year, I also burn the entire year to DVD. That way I can put one copy – either the monthlies or the yearly, at my Mom’s house for safekeeping. There’s just one problem with this system … you gotta remember to do it! I just took a look at my spindle of backup disks and it ends in December … this is March! My Bad! 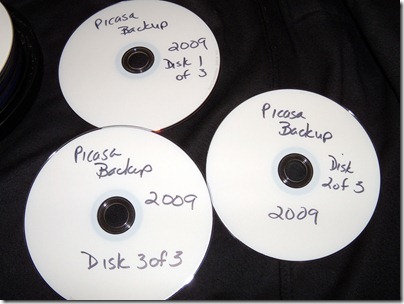 In the video below, I show you exactly how I backup my January 2010 and February 2010 photos. The monthly and yearly systems I describe above are actually ‘Archives’ because the pictures they backed up may be removed from my computer altogether. I know that I can find a picture from August of 2004 by going to my archive of disks regardless of what computer I happen to be using and what is on it. The ‘nightly and continual backups’ I describe above are for disaster recovery purposes, all those pictures *are* on my computer. I’m backing them up every night just in case something should happen to my computer. I keep 2 years worth of pictures on my computer – about 8,000 pictures, but I like having instant access to pictures from years ago. So, I keep the rest of my pictures (about 23,000) on an external hard drive. 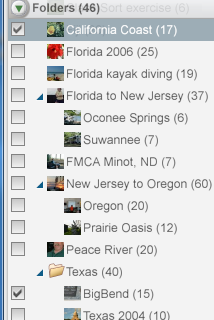 I have Picasa ‘watching’ that hard drive so, when I view my pictures in Picasa I see all 30,000 pictures . But I know that only the 8,000 on my computer’s C drive are being backed up each night. If anything should happen to my external hard drive, I always have my archive DVD disks. 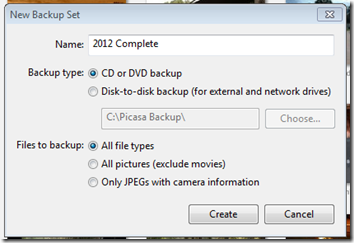 Show Me How: Backup your pictures monthly with Picasa. When you use the Tools / Backup Pictures command, you might be distressed that the option to view in Tree or Flat View isn’t there. 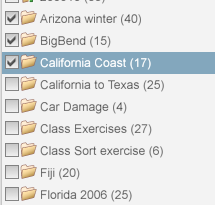 In Tree View, you see that California Coast is on its own, and BigBend is inside the Texas Folder. Everyone organizes their picture folders differently. Just like any filing system it’s up to you how to file them. Backup is a very important factor in how you organize, so, if you’ve nested folders for backup purposes – this is a very handy tip to be able to see your nested ‘tree’ view in the backup process. Need to learn the basics? Check out our ‘Beginner’s Guide to Picasa’ complete with show-me videos. I sometimes feel like a broken record, telling people to backup their photos. Just when I figure that *everyone* has the idea and I can rest, I read something like this post in the Picasa Help Group where someone lost 15,000 photos when their computer crashed. !?#!!??@!! One of the biggest reasons that I recommend Picasa so highly is that it makes backups SO easy. First, let me make sure we understand each other with the term ‘Backup.’ It means having a copy of your photos somewhere separate from your computer. These are for emergency purposes. I recommend using CD-Rs or DVD-Rs. I buy the discs in bulk, they come 50 to a spindle. I make a backup every month, of that month’s photos. Then I put the backup discs on an old spindle and keep them in a cupboard. I’ve been backing up photos and other important files this way for over 10 years. I had occasion to look thru some of the older backup discs the other day, and the pictures were in perfect shape. Wait until it completes that DVD. It will spit it out and display a message requesting the second DVD. Then it repeats for the third. I’ve had a few emails from Picasa users lately that got me worried. They said that they uploaded some photos to their web albums then deleted them off their computer. NO! 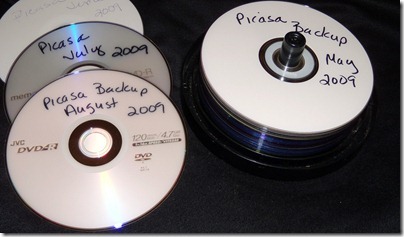 Picasa Web Albums is not a way to backup or store your photos. It is a way to share your photos with others over the Internet. If you want an online storage website, we recommend Carbonite. When you upload photos to Picasa Web Albums, you should be using a much smaller size than your original photo. My camera is a 6.3 megapixel camera – yours may be more or less. That means a picture taken by my camera at highest resolution will have 6.3 million pixels – the little dots. Usually that’s 3,072 pixels wide by 2048 high. When a photo is displayed on a computer screen (which is the whole purpose of Picasa Web Albums) an 800 by 600 pixel picture looks big. Most computer monitors are set to 1024 pixels wide, so an 800 wide picture will take up 80% of the screen. I upload my photos at the 1024 pixel setting. This is 1/3 of the pixels in my original photo. This also means the file size is a lot smaller. I have several hundred photos online and I’m only using 60% of my alloted 1Gigabyte of free space. Deleting your original photo because you have it uploaded to a web album is like throwing away your original Van Gogh painting because you have a copy print. Even if you upload to Picasa Web Album at full size, it will be compressed, and the result is not as good as your original. If you ever want to print it, you’ll want your original. But, probably the main point though, is that once you’ve uploaded your pictures to a free website like Picasa Web Albums, things could happen to them beyond your control. I’ve heard of people who had Web Albums that had been tagged as violating the Terms of Service and were then deleted by Google. Even if it’s a mistake, it can take a long time to clear it up. I know other websites that got hacked and the content destroyed. Admittedly, this is unlikely, but if you still had your pictures on your computer, it’s a simple matter of re-uploading them. So, what is a good procedure? You don’t have to follow that exact procedure – just make sure you follow a procedure that allows you to work with all your pictures, share a few of them, and have a duplicate set of all your originals in case catastrophe hits.